In this video, we will discuss different types of ActionResult objects that can be returned by an action method. The following is the signature of a typical action method in a controller. Notice that, the return type is ActionResult. ActionResult is an abstract class and has several sub types. Here is the list of all sub-types of ActionResult. 2. Click on "Download Binaries" button, and extract them to a folder. 3. Run ILSpy.exe which can be found in the folder, where you have extracted the binaries. 6. At this point System.Web.Mvc assmbly should be loaded into ILSpy. 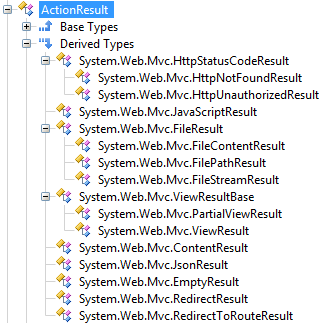 Expand System.Web.Mvc, then expand ActionResult and then expand "Derived Types". You should now be able to see all the derived types. Why do we have so many sub-types? What should be the return type of an action method - ActionResult or specific derived type? 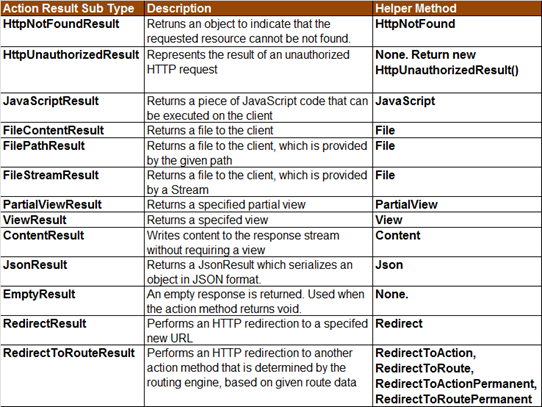 It's a good practise to return specific sub-types, but, if different paths of the action method returns different subtypes, then I would return an ActionResult object. An example is shown below.